The Spectacular Spider-Man magazine #2 © 1968 Marvel Comics. COVER ART BY JOHN ROMITA, SR. The Green Goblin (Willem Dafoe) terrorizes New York City in Spider-Man (2002). The Green Goblin is, bar none, Spider-Man's greatest nemesis. No one, including his creators writer Stan Lee and artist Steve Ditko, could have imagined from the character's first appearance in The Amazing Spider-Man vol. 1 #14 (1964) that this grinning gargoyle would spawn a succession of Green Goblins and Hobgoblins, and the Demogoblin, notwithstanding alternate-reality variations. Amid this lethal lineage, one true Goblin reigns supreme: the original, Norman Osborn. “Gobby is truly the only supervillain who is also a good guy when he's not breaking up Spidey's act,” reflected Lee in the 1976 trade paperback Bring on the Bad Guys. While calling Osborn a “good guy” might have been a stretch even for Lee, whose wizardry with fun-spirited hyperbole has made the Marvel Comics master a larger-than-life figure as popular as his world-famous co-creations, he was correct in that Osborn, the hard-edged industrialist father of Peter (Spider-Man) Parker's classmate and eventual roommate Harry Osborn, was originally a benefactor to society at large. Osborn's stature might be comic-book legend, but when the masked Green Goblin stormed into Spidey's life in Amazing Spider-Man #14, his identity was a secret (the Osborn character did not appear until 1966's issue #37). What was clear was that this oddly garbed creature could have easily transitioned into hawking for a Halloween costumer given his garish getup of a purple leotard, conical cap, and purse-like satchel. Zipping over Manhattan rooftops on a jet-powered flying broomstick, the Goblin was determined to unite New York's mobs under his leadership (which would eventually be the Kingpin's M.O., although that Spider- foe was still three years away from his debut) and conspired to kill neo-hero Spider-Man to earn a rep among the underworld. Hiring the supervillain team the Enforcers for extra muscle, the Goblin nonetheless failed to destroy the wall-crawler, a defeat his uninhibited ego could not endure. The Green Goblin soon abandoned his broomstick for his turbine-powered, bat-winged, smokespewing Goblin Glider, but since his introduction the villain's arsenal, dangerous weapons of his own design, has remained essentially the same: his pumpkin-shaped goblin grenades, capable of emitting concussive or incendiary blasts, or hallucinogenic gases; plus voltage-zapping gloves. After issue #14, the Goblin's gangland aspirations unfolded, quite briskly, every few issues, encouraged by what Lee called an “avalanche of mail.” Yet it was artist John Romita, Sr. who, as Ditko's replacement on Amazing Spider-Man, penciled the Goblin's signature story, in issues #39–#40 (1966). Herein the Goblin dulled Spider- Man's protective spider-sense with a gas he created, allowing him to spy on the hero and discover his alter ego. Kidnapping the flabbergasted Peter Parker, the grandstanding Goblin, in his lair, revealed his own secret identity, as well as his origin, to his helpless, bound enemy: Norman Osborn had framed his business partner Professor Mendel Stromm for embezzlement to grab sole control over their technology corporation (later Osborn Industries, and eventually Oscorp), and hoped to profit from Stromm's notes for “strange-looking formulas.” Osborn's attempt to create such a formula produced an explosion; he survived this accident with enhanced strength and intelligence, but was also made mentally ill, prone to unpredictable outbursts. In a climactic battle with Spider-Man, the Goblin received an electrical shock that erased his memory of his Goblin identity. Spidey chose to hide from Osborn his supervillainy, living with the uncertainty of his foe's memory resurfacing. In later stories, writer Lee seemed to relish toying with readers as Osborn's powderkeg Goblin personality smoldered, occasionally erupting, after which Spidey was barely able to re-induce his arch-foe's amnesia. In writer Gerry Conway and penciler Gil Kane's Amazing Spider-Man #121–#122 (1973), Osborn regained his Goblin memories and struck at the wall-crawler through his lover, Gwen Stacy, tossing her off the George Washington Bridge to her death. In an ensuing fight with Spider-Man, the Goblin was impaled by his own Goblin Glider. Harry Osborn, who for years was psychologically abused by his overbearing father, assumed the Green Goblin identity in issue #136 (1974) after discovering his roommate Parker's secret identity. The dilemma of battling his unbalanced friend plagued the web-slinger through several clashes with Green Goblin II, leading to a final encounter when Harry was fatally poisoned by his father's Goblin serum in Spectacular Spider-Man #200 (1993). (Harry left behind his widow, Liz, and their son, Norman, or “Normie.” In the alternatereality, “next generation” Spider-Girl series, 1998–present, Normie is the Green Goblin.) Before Harry's death, his psychologist, Dr. Bart Hamilton, discovered the Goblin's secrets while treating young Osborn's psychosis with hypnosis. 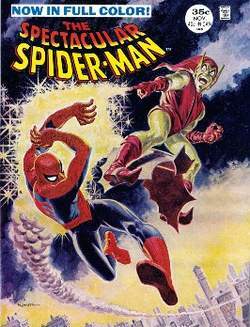 In Amazing Spider-Man #176–#180 (1978), Hamilton became the Green Goblin III, warring with the crime czar Silvermane before meeting his demise in a grudge match with Goblin II. The first of several criminals to plunder New York as the Hobgoblin debuted in 1983, eventually followed by the demon/human hybrid Demogoblin in 1992. A fourth Green Goblin, Phil Urich, nephew of reporter Ben Urich (a supporting-cast player in Spider-Man and Daredevil), happened across Harry Osborn's headquarters and became the Green Goblin IV in Web of Spider-Man #125 (1995). Urich became an anti-hero in the guise, winging through the sky in an updated version of the Goblin outfit and headlining his own thirteen-issue title, Green Goblin (1995–1996). Haunted by the specter of those preceding him, Goblin IV soon hung up his tights. A world without a Green Goblin might be Spider- Man's preference, but it was not Marvel Comics'. The four-part storyline “Revelations,” serialized through the various Spider-Man titles in 1996, returned Norman Osborn from limbo (and retroactively amended some of Spidey's continuity). It was disclosed that his Goblin formula had allowed his body to heal his once-fatal wound. After awakening on a morgue slab, Osborn went into hiding for years with the underground cabal called the Scriers. The death of his son Harry brought Osborn out into the open to renew his assaults against his arch-foe, which included his manipulation of the Jackal's efforts to clone Spider-Man, the slaughter of Parker's clone Ben Reilly, and the death of Parker's Aunt May (later revealed as a sick hoax). In the 2000 miniseries Spider-Man: Revenge of the Green Goblin, Osborn drugged and brainwashed Parker, attempting to groom him to become the next Goblin. None of the reborn Green Goblin's storylines shocked—or enraged—fans more than the introduction of the Stacy Twins in the J. Michael Straczynski– written/Mike Deodato–penciled “Sins Past” in Amazing Spider-Man #509–#514 (2004–2005). Years ago, the charismatic Osborn seduced young Gwen Stacy into an affair, impregnating her, then shunting her off to Europe to secretly give birth to twins. Aging rapidly due to their father's Goblin serum-tainted blood, the super-agile Gabriel and Sarah Stacy, when physiologically aged to their late teens, confronted Spider-Man, thinking him to be their father. Upon learning of his true parentage, Gabriel became the Gray Goblin, continuing the warped legacy of Spider-Man's deadliest foe. The Ultimate Green Goblin, from Marvel's reimagined Ultimate Spider-Man series (2001–- present), is a hulkish, mutated goblin-man, a transformation originating during Osborn's failed attempt to recreate the accident that turned teenage Peter Parker into the Ultimate Spider-Man. The Green Goblin appeared in the 1967, 1981, and 1994 Spider-Man animated series, the 1981 Spider-Man and His Amazing Friends cartoon, and the 1999 Spider-Man Unlimited show. 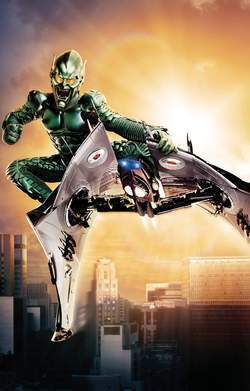 Over the decades, the Green Goblin has been featured on Spidey-related board games, toy viewers, action figures of various sizes, and video games, among other licensed items, but no mass-media presentation is more famous than director Sam Raimi's liveaction blockbuster Spider-Man (2002). Willem Dafoe was perfectly cast as Norman Osborn, who, like his comics counterpart, was driven to madness as his strength-enhancing experiment went awry, but comic-book diehards disliked the design of the Green Goblin's high-tech, body-armored costume, particularly its faceplate mask, which obstructed Dafoe's own sinisterly expressive features (the Goblin has adopted a similar appearance, sans the iron mask, in the comics since the film). The movie's climax adapted the bridge-top battle royal of Amazing Spider-Man #121–#122, with Mary Jane Watson replacing Gwen Stacy, but surviving the ordeal. Dafoe's Goblin died in a similar Glider accident, compelling events in the sequels toward Harry Osborn's (James Franco) eventual ascension into his father's footsteps.